Mona Vale on Sydney's northern beaches was originally known as Bongin Bongin. It was renamed in 1858 after the first farm in the area called 'Mona', which means 'high born'. Mona Vale pool is on the tip of a sand spit between two beaches. When the tide is high, the pool is surrounded by water making it look like an island. It is a very popular spot among Sydney photographers. This image belongs to the travel and nature stock photo library. This stock photo of Mona Vale Beach Tidal Pool at Sunrise is available for licensing for commercial and editorial uses including websites, blogs, books, magazines, brochures and advertising. Restrictions may apply for images which contain third party copyrighted material or sensitive subjects. Photos of artwork are for editorial use only. 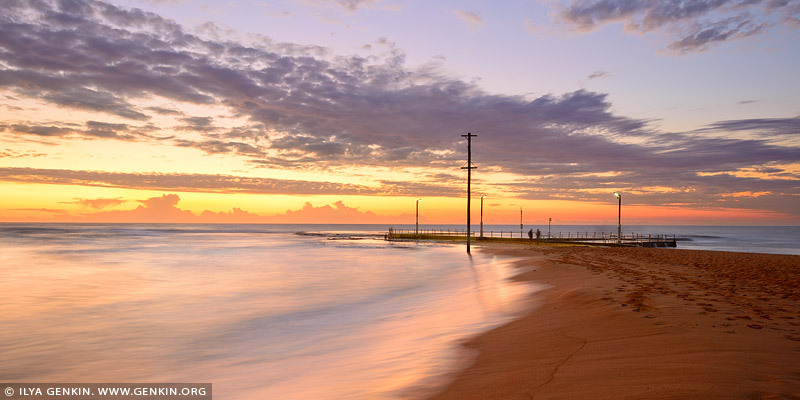 This image id AU-MONA-VALE-0003 of Mona Vale Beach Tidal Pool at Sunrise, is copyrighted © by Ilya Genkin. This is not a public domain image.